Disney owns Marvel and has control over most of their heroes, leaving Sony and Fox to hold on to their respective Marvel properties with a firm grasp. Joss Whedon helps oversee the direction over at Disney, and Mark Millar does the same over at Fox. 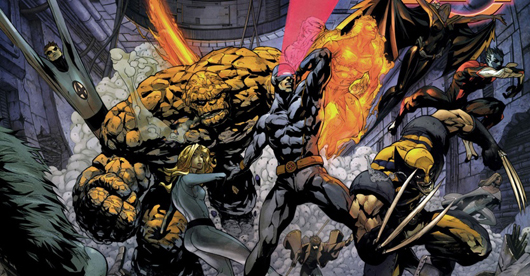 Now, Fox has hired X-Men: Days Of Future Past and Star Wars: Episode VII writer Simon Kinberg to a three-year deal, where he will be tasked to expand the X-Men and Fantastic Four Universes. Kinberg was already a writer and producer of both X-Men: Days Of Future Past and the Fantastic Four reboot, so the news of the hiring shows how much faith Fox has in his work. In addition to his new workload, Kinberg is also writing the aforementioned Star Wars: Episode VII, the Star Wars spinoff films, and is executive producer on Star Wars TV series Rebels; he is also a producer on Disney’s Cinderella, and Neill Blomkamp‘s Chappie. It’s very clear what Fox wants to do with their X-Men cinematic universe since DOFP director Bryan Singer announced that Apocalypse would be appear in an untitled 2016 sequel. The hiring also means that Kinberg is very likely to work with director James Mangold on the sequel to The Wolverine. Fox hopes the hiring means that they can merge their properties together for one cinematic event, the same way that Marvel brought their properties together for The Avengers. So what do you think? Did Fox make the right move? What does this mean for Mark Millar? Where does he fit into all of this if he was hired to expand Fox’s properties?